Any business that is serious about their online presence should also be serious about collecting emails from website visitors. Email marketing (when executed correctly) can play a crucial role in the overall marketing strategy of any business. Furthermore it gives you the ability to reach out to your customer or fan base instantly. After you have a website visitors email, you can start reaching out to them and building a relationship with them. This is one method you can use to build trust. People buy from companies or services that they trust and email marketing is a strategy that your company or brand can develop to build that trust. There are different ways that you can entice people to give you their email address. Some examples include offering something of value such as a training video or e-book. You do not need to over-complicate this process. As long as it is something that people value enough to give you their email address. It is common to visit a site and see a box on the side of a web page that says, “enter your email address to get our weekly newsletter.” It is good that the site is collecting emails but they are not offering anything of value and therefore visitors may not be as compelled to give their email address. There are many different WordPress plugins, both free and premium, that you can use to increase the number of emails that you collect from your website visitors. 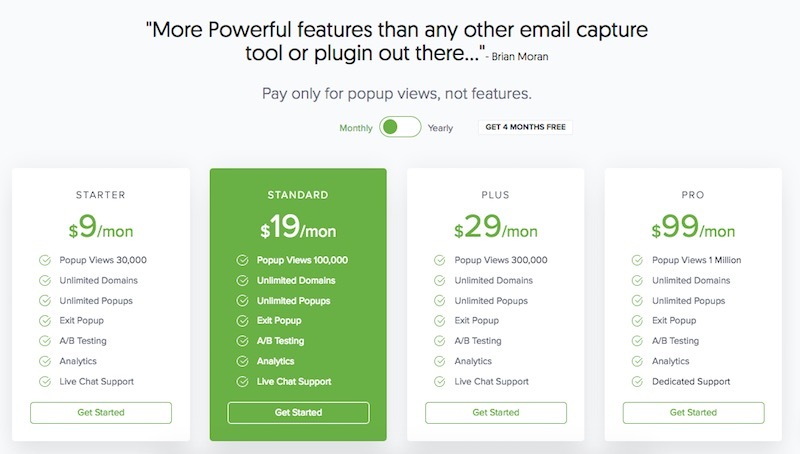 This post will compare and contrast 7 popular plugins that you can use to collect emails. Hopefully, by the end of it, you will be better informed to decide on what plugin is right for you. The first plugin on the list is a free plugin by Fancy Themes. Even though it is a free plugin, is has quite a bit of customization options and is mobile friendly. According to the developers site, it can connect with: AWeber, iContact, MailChimp, Get Response, MadMimi, and Interspire Email Marketer. If you are using a different email service then the services listed, then this plugin will not work for you. Optin Form allows you to easily change the look and feel of the plugin, plus there are options that allow the plugin to appear on particular pages and/or posts. This can be a helpful feature, if your optin messaging is specific and should only be seen by people visiting certain pages, etc. Hello bar is a plugin designed specifically for collecting emails but comparatively to other email plugins, this plugin can only appear at the top of web page. Whereas, other email plugins can appear in other areas of a website. This is a nice feature as it makes it easy to configure and is always easily visible to website visitors because the bar is always at the top of the page even if a visitor scrolls down the page. You can change the colors, text and general appearance of the bar. One limiting factor is that you cannot connect as many email service providers as Optin form. According to the hello bar website, you can connect the following email providers: Aweber, Campaign Monitor and MailChimp. Hello Bar also has some additional features that many other email plugins do not have. These include social sharing buttons and A/B split testing. Split testing is an advanced internet marketing term that refers to the ability to alternate two variations of a form or page. After the page is viewed a number of times, the variation that has the most email submits is deemed the winner. In simple terms, this feature allows you to test what variation of a form collects the most emails. Sumo originally known as Sumome is a great plugin that offers a host of functionality for websites. They have a variety of features including; email optin configurations, social sharing buttons, smart bar (similar to Hello Bar), heat map analytics, contact form, and more! Do not get too excited as some of the features cost money to get get access too. Additionally, some of the app versions have very limited customization options in their free form. But, at least you can try it out and see if you like the basic functionality and then upgrade to the pro version if you wish. If you do have a budget to allocate to the plugin, then it is a great all-in-one plugin that is relatively easy to configure and offers many great features. This is a premium email optin plugin and unfortunately does not have a free version, if you want to test it out. But, if you end up spending the money, this plugin has some awesome features for collecting emails and optimizing email forms. It has an intuitive form builder, allowing you to create custom forms with different colors and text, limited, only by your imagination. There are settings so you can display customized forms on certain pages and/or posts therefore showing targeted email optins based on visitors location and/or behavior. A nice premium feature is that it has a dashboard, breaking down email optin statistics so you can easily see which forms are working and which forms may need tweaking. OptinMonster has a host of additional features and is worth checking out. This is another premium software that can do ALOT more then just collect emails. LeadPages advertises itself as a landing page builder which it is but it is also great software for creating and customizing email forms. Within LeadPages, in addition to the landing page builder, there are many of the same features that other optin email plugins advertise. These include but are not limited too; leadmagnet delivery, double optin, pre-populated form fields and an intuitive dashboard to understand how your optins are performing. Leadpages is a great product if you are going to take advantage of all the features that is has to offer but if you are looking strictly for an email optin marketing plugin, then you will end up paying for much more than you need. Leadpages is a premium software product and has many different internet marketing features. It is a great product to use if you plan on using most of their features. We suggest looking at other options, if you are only looking for an email optin solution. You can choose to pay monthly, annually or bi-annually. When you commit to longer time then the monthly costs go down. Bloom is another premium email optin plugin made by Elegant Themes. Bloom has many different features that you can use to customize the look and feel of the email optin forms on your website. Similarly to other plugins reviewed on this page, Bloom features a dashboard which you can access on the WordPress dashboard, which you can review the analytics about how different forms on your website are preforming. This is a great feature to utilize so that you can make changes to optimize offers and increase the amount of emails that you collect on different pages and/or posts. Bloom also integrates with 16 different email marketing services so connecting to your existing service, if you already have one, should be easy. Although Bloom has many great features, it comes at a price. Bloom is a product by Elegant Themes and they have many different products including WordPress themes and other WordPress plugins. Based on their pricing structure, you have to pay either an annual fee or a one-time fee which then gives you access to all of their products. While this price offers good value, if you only want access to this particular plugin, then a different email optin plugin will be cheaper. This plugin is strictly an email optin plugin for wordpress and does not offer any additional features compared to some of the other plugins that we have reviewed. Since the software is strictly for email optins, it has many features to help customize email forms and optimize new email optins. They also have many email optin templates to choose from which are all customizable. This plugin has the most features out of all the plugins that we have reviewed thus far and is great for anyone that wants to make the most of their email optin plugin. 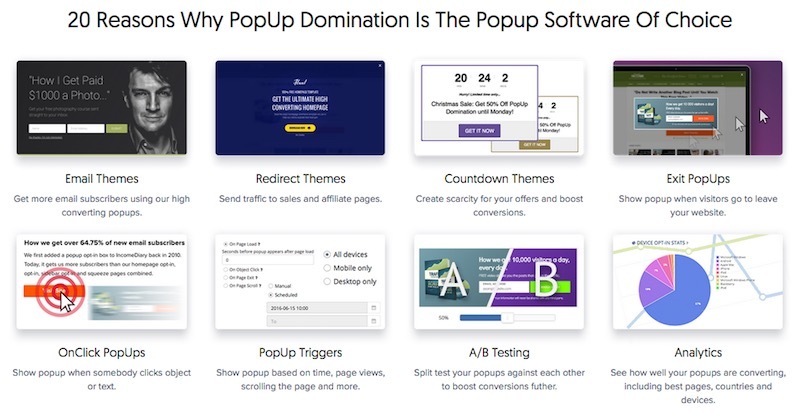 Popupdomination has a simple pricing structure and is tiered based on the number of views that your email optins receive per month. This is great because you can install the plugin on an unlimited number of sites without having to pay additional fees. Furthermore, you are not limited to the number of features because of your payment plan. The last email optin plugin on the list is Thrive Leads, one of the many software products from Thrive Themes. This is an amazing plugin that has many great features similar to some of the other plugins on this list. Some of their great features include; custom form designs, advanced form display targeting, A/B split-testing and an actionable insight dashboard. We really like all the features that Thrive Leads offers and believe it is one of the best plugins on the list. Another great aspect of the plugin is that the cost of the plugin is a one-time fee so there are no reoccurring fees as there are with some of the other plugins. Thrive Leads pricing is quite simple and is based on the number of sites that you want to use the plugin on. 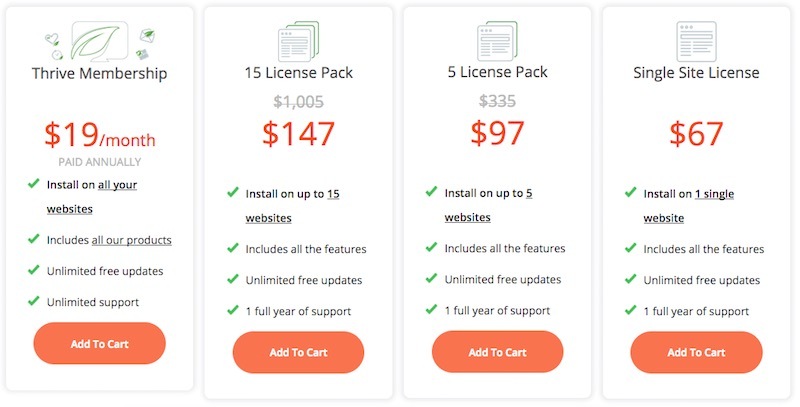 They sell licenses in packs for either 15, 5 or an individual site license. 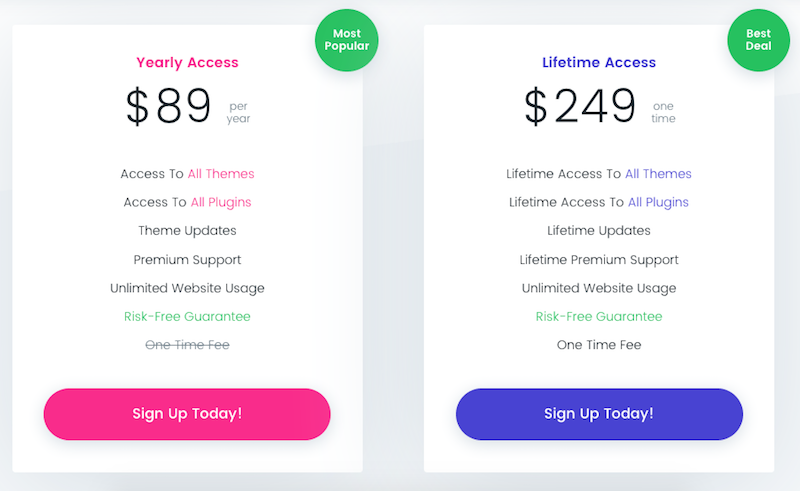 Alternatively, you can may a monthly reoccurring fee of $19 which you pay annually for access to all of the different software products that Thrive Themes make. This pricing structure is great because compared to many of their competitors, you pay only one-time whereas their competitors charge a monthly reoccurring fee. After looking at these 8 plugins, we discovered that there are many different plugins to choose from with different features and costs. We strongly encourage you to start with a free plugin if you are new to email marketing and are learning how all the different parts fit together. We also advise going with a free plugin if your website is not getting a lot of traffic because it is not worth paying for a plugin unless you have enough website traffic to generate email subscribers. Once your website is receiving visitors and you have signed up to an email marketing service such as MailChimp, Constant Contact or other service then you may want to explore a paid email optin plugin. We suggest going with Thrive Leads because it offers many standard email optin features and has advanced features including A/B split-testing, analytic dashboard and great support. Additionally, they offer a one-time charge per website whereas many other premium plugins charge a monthly reoccurring fee.